This is in answer to many of your questions regarding the darkness that envelops our life from time to time, in varied frequency. 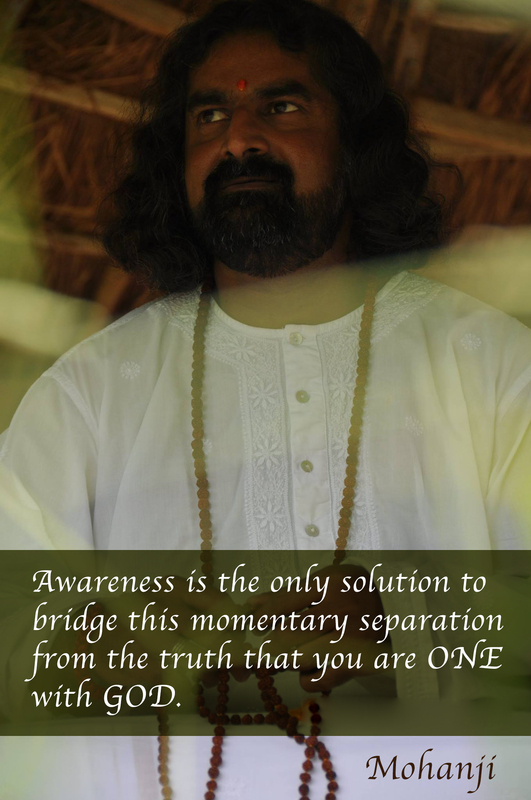 Awareness is the only solution to bridge this momentary separation from the truth that you are ONE with GOD. This is an attempt to give you a helping hand to raise you to that level of awareness, which if you invest your time and energy on, will help you lead a life full of joy. When man moves towards liberation from all that binds him to the earth that created life times on earth, each blocking factor will come to the surface to deter him from a total liberation. One by one they appear – the fears, the anxieties, insecurities, jealousies, anger, phobias, doubts, needs, desires, places, people, time, situations, relationships – the list is usually long. They all stay hidden in the hard drive of human existence as long as he leads a mundane life of total ignorance and repetitive past impressions. 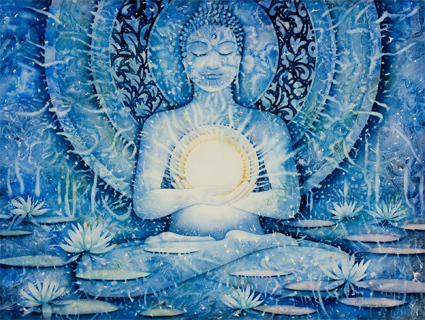 When awakening happens in him that everything around him is relative and false, shallow, repetitive or useless and the truth is the state of bliss and the mind with all its ingredients are blocking this realization and corresponding experience, man chooses liberation with all his heart and soul. This is a challenging time. These are the times when mind intensifies its efforts to capture man back to slavery over liberation. This is when various layers of darkness is brought to delude man from his progress. Mind fights and struggles to stay alive. Determination for salvation helps in this journey. Faith is the key. Faith is a must. Faith helps much more than any other understandings. When mind deludes, faith helps. When darkness deludes, faith comes as light. When he arrives at total liberation, everything will disappear, including mind and the faith. There will be no mind to even hold the faith. Darkness that envelops occasionally for a period of time is caused out of illusion. Mind gets deluded at times because of overwhelming emotions. Mind even entertains delusions to stay alive. This is why nurturing objectivity at all times is extremely essential. When mind gets deluded, it starts to see the shadow instead of the form that created the shadow. It starts to believe that the shadow is real and feels that the form is absent or insignificant. It forgets the form, which is the true reality and connects to the shadow instead. This delusion is usually accented by concepts acquired from the past, repetitive habits, manifested impressions as well as wrong understandings saved by the mind over time. So, whenever dark patches of delusion falls into your mind, choose to be with light. Faith helps in such conditions. The darkness may attempt to delude even the faith. But, stay on and stay fast. 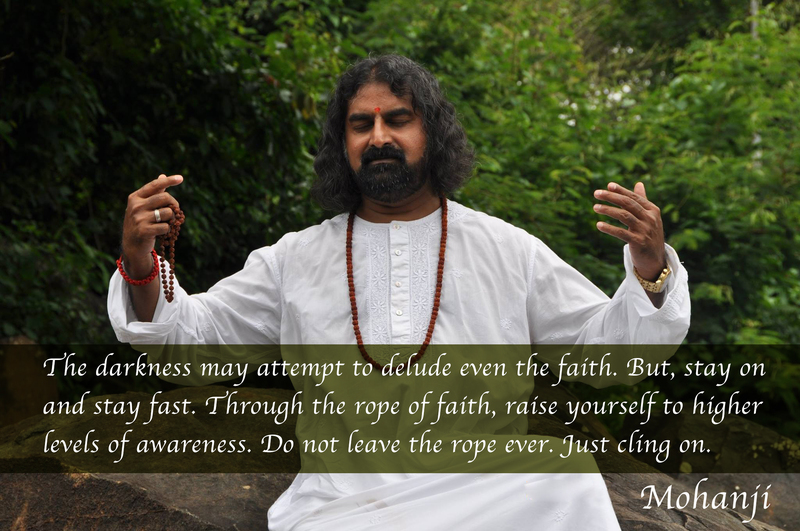 Through the rope of faith, raise yourself to higher levels of awareness. Do not leave the rope ever. Just cling on. You may not realize. You may not know this, but it is true that this drama of mind, this soap opera has been repeated over and over again over life times. This is what all the wise men who ever walked the earth told us, warned us and taught us. One single truth were they repeating over time, that we are eternal beings temporarily deluded because of the wrong identifications on earth. 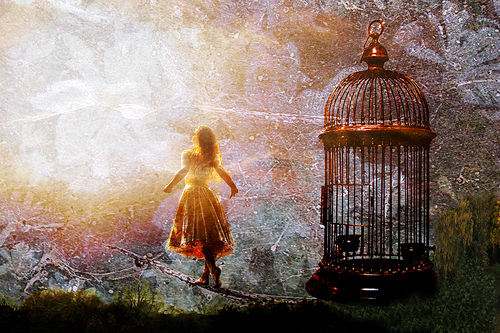 We are liberated beings that forgot the state of liberation. We are liberated, here and NOW. The only shift we need is this awareness. Do whatever it takes to achieve that. We should be careful that we should not entertain any thought, word or action that may take us even temporarily to the dark space of lack of light. We must be careful not to give in to the darkness; and our mind. We must perform only actions, words and thoughts that establish us in light. This would mean total unselfishness and total selflessness. Ability to share what we have without second thoughts effortlessly and ability to help unconditionally is extremely important. This is the existence of a true yogi. He will enjoy whatever is provided to him without guilt, will never cry over what he does not have, and will be willing to share whatever he has with whoever comes his way. This is the existence of a true yogi. Be aware. Darkness and light cannot sit together. Darkness is delusion. It has nothing in it. No substance. It is just absence of light. Light has substance. It has energy. Darkness has no energy. Whatever has energy gives life. Energy is life. Life is energy. So, climb up the rope of faith into the awareness that you belong to the light because you have a life. Darkness cannot give you “LIFE”. Darkness has no substance. Lack of substance cannot give you any substance. Darkness can only give you emotions such as fear and insecurities. Light gives energy. It never takes energy. Light illumines and brightens our life. It never takes our inherent brightness away.Darkness and delusion takes energy. Darkness consumes energy and leaves the person empty and sick. Darkness is absence of light and it has no permanence. Light has permanence. Your true self is permanent. Hence you belong to the light. You are the light. In the case of human existence, ignorance of truth is darkness. Truth is that you are the light and you always will be. Untruth is the darkness of your terrestrial existence, along with the feeling that you are this entity or the image created for a period of time in the given living space – which is called one lifetime. This is temporary. You are not temporary. Darkness is temporary. You are not that. You are permanent. So, you are the light. Since darkness and light cannot live together, only when light leaves can darkness exist. Darkness is non-understanding, ignorance and delusion. Darkness raises fear and disillusionment. Fears and delusions have no existence with light. Hence it is important to stay with light. Light is awareness. Awareness is light. Stay with the awareness that you are the light. Loved the post ! Thank you very much Mohanji. Thank You for reminding us once again on this essential truth. Always right on time. Its true….it always happen with me…. the harder I try to go ahead one of these illusion comes in my way and many time I get carried off….. Thank you again for making us aware and request you to kindly keep reminding us as we (Pamar) bound to go back on the old track…. Love you My Lord My Master Mohanji…. Thank you Master for your words of wisdom. It is like applying balm to the psyche that was in deep turmoil. We are grateful. Thanks a Lot for showing the Path to Self realization and Self Awareness. My Family needs Your Blessings. Mohanji wishes you and your family highest awareness and liberation. Love. Dear Mohanji…. Thank you for the beautiful lesson and reminder. Everytime a sad situation comes up…I get immersed in the darkness. Its so scary. With a little awareness and faith, yes, the light comes back. 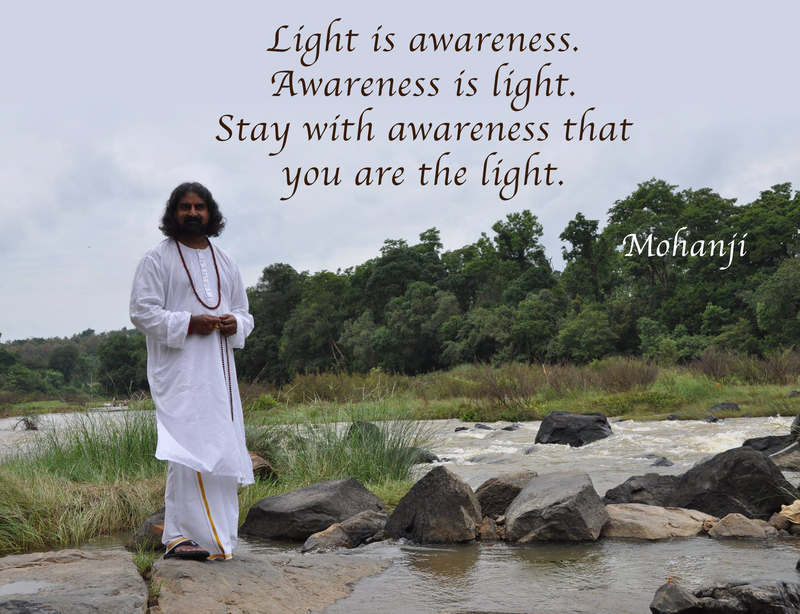 Be with us Mohanji that the light of awareness never leaves us. Pranams. Blessings sought.